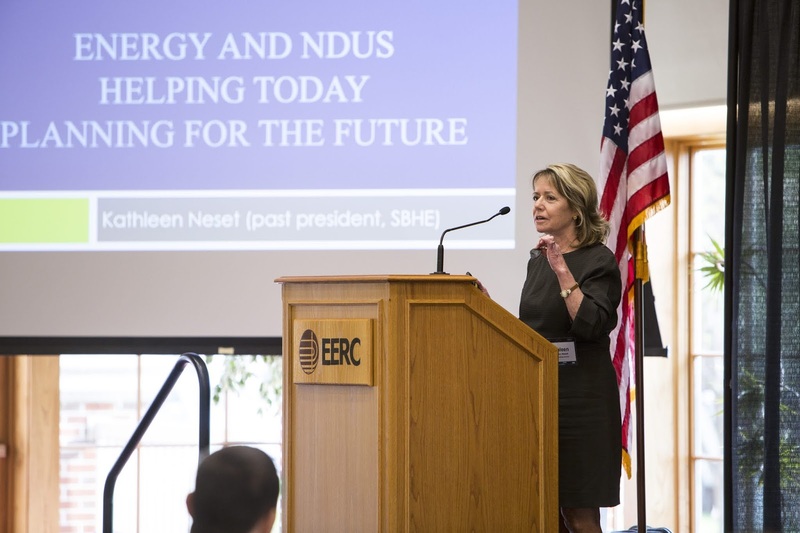 The Energy & Environmental Research Center (EERC) hosted the 3rd Annual Partnership Summit on May 10. 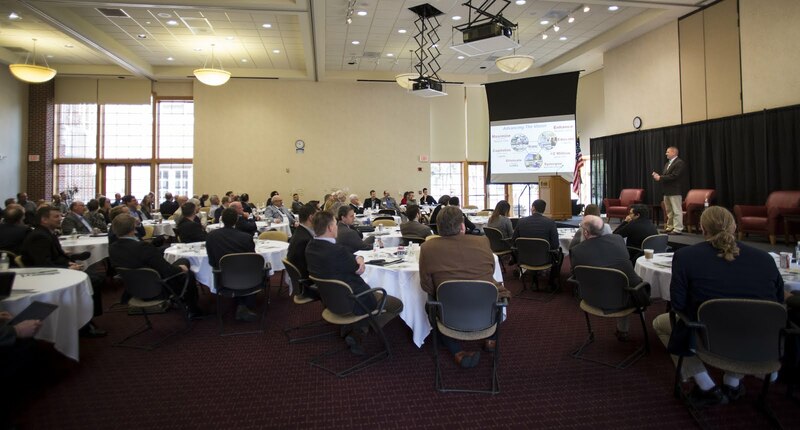 The event served as a forum for partners from multiple energy industry sectors to discuss critical topics. 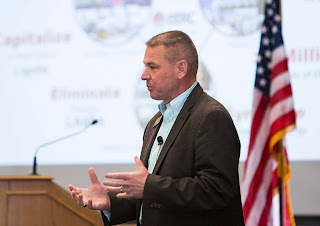 North Dakota Petroleum Council President Ron Ness welcomed over 100 attendees, who represented public utilities, private industry, government entities, and energy research experts. 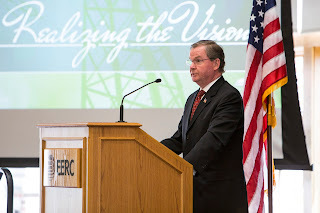 Keynote speaker Steven Winberg, U.S. Department of Energy’s Assistant Secretary for Fossil Energy, discussed the nation’s transition from an energy importer to a top producer, moving toward exporting. He highlighted North Dakota’s collaborations between universities, industry, and state and federal government as the example for the nation. North Dakota Lieutenant Governor Brent Sanford discussed energy’s vital role in the state’s economy and key state initiatives. North Dakota Agriculture Commissioner Doug Goehring discussed opportunities to capitalize on the state’s agriculture and energy synergies, and North Dakota Senator Rich Wardner provided updates on the Energy Development and Transmission Committee’s priorities for the upcoming legislative session. Neset Consulting CEO and State Board of Higher Education member Kathleen Neset discussed ways to prepare future energy industry employees for their careers while they are students. A multidisciplinary discussion panel focused on carbon dioxide and its role as a bridge between different energy sectors; specifically, between Coal and Oil and Gas. EERC Vice President for Strategic Partnerships John Harju moderated the panel of experts who included Stacey Dahl, External Affairs and Communications Manager at Minnkota Power Cooperative; Robert Mau, President of Eagle Operating, Inc.; and Michael Nasi, partner with the Jackson Walker law firm. “We have not only the opportunity but also the obligation to the citizens of North Dakota to change and prepare for the future,” says EERC CEO Tom Erickson. “Venues like this foster collaboration on those opportunities." Bismarck, N.D. – A research and development project focused on advancing new technologies to prevent and detect pipeline leaks is moving ahead after receiving approval and a $1.6 million grant from the North Dakota Industrial Commission (NDIC) this week. Leaders within the oil and gas industry in the state proposed the Intelligent Pipeline Integrity Program (iPIPE) in direct response to a challenge made by Governor Doug Burgum last year to eliminate pipeline leaks through innovation. The grant will be matched by private contributions made by industry partners in the program, for an overall cost of $3.7 million. The iPIPE consortium partners include Hess Corporation, Equinor (formerly Statoil), Goodnight Midstream, Oasis Midstream Partners, ONEOK, the Energy and Environmental Research Center (EERC) in Grand Forks, N.D. and several technology providers. The $1.6 million from NDIC’s Oil and Gas Research Program, together with industry support of the project, will fund the planned three-and-a-half year program. The iPIPE consortium has proposed incremental funding of the project to allow for additional program partners and research as consortium membership and investment from oil and gas companies grows. Lohnes and other industry leaders say they hope iPIPE will serve as a nationwide model for responsible state involvement in infrastructure integrity research and development. The NDIC consists of Burgum as chairman, Attorney General Wayne Stenehjem and Agriculture Commissioner Doug Goehring.